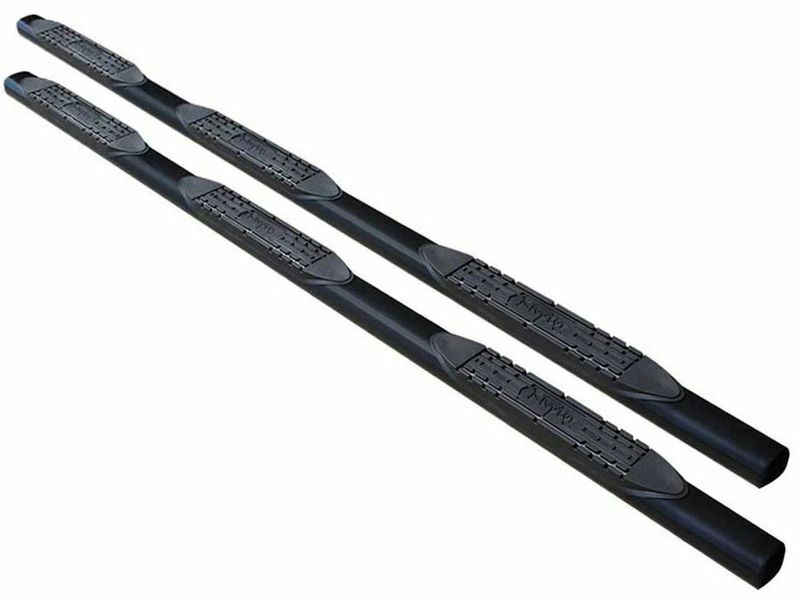 The Raptor 4" Wheel to Wheel Black Oval Nerf Bars are a 4" saddle style truck step that provides a wheel to wheel stepping surface for your truck. With the wheel to wheel expansion of the truck step, you're sure to get a great step from the front or back seat. The welded end caps finish off the truck step and give it an overall custom look. The Raptor 4" Wheel to Wheel Oval Nerf Bars are designed to keep your truck looking as sharp as possible. No one wants to risk the custom look of their truck for some Nerf Bars; and now you don't have to! The high strength carbon steel is double E-coated for maximum blackness and protection. E-coating is more advanced than a powder coat and keeps your Nerf Bars looking new year round. The Raptor 4" Wheel to Wheel nerf bars are not only stylish, but are capable of carrying up to 500lbs! The carbon steel is extremely durable and with the double E-coating, keeps your truck looking great. The wide 4" step pads are slip resistant and make for a perfect entry every time! The Raptor 4" Wheel to Wheel Black Oval Nerf Bars come with custom brackets that fit into the OEM mounting holes. That's right, no drilling is required to install these bad boys! A few simple steps and your new Nerf Bars are ready to go! Raptor has put a 10 year warranty on these great Nerf Bars! The Raptor 4" Wheel to Wheel Black Oval Nerf Bars are not only stylish, but durable. Raptor can confidently say you're getting a great truck step with a great warranty.